One of the most daunting makeup categories has to be foundation. No matter how many articles are written about finding just the right foundation, the questions and confusion never seem to stop. It doesn't help that there are so many different formulas and types to choose from. I have so many foundations in my kit, not because you can't mix and create new colors, but because women have all different skin types, and what works on one woman doesn't necessarily work on the next. Someone with oily skin wouldn't be served well by a luminizing foundation, and a woman with dry skin should clearly avoid any type of matte formula. I'm going to break down a few formulations and let you know who they work best for, and hopefully this will help provide some insight into the crowded, confusing, often confounding world of foundation. Take a deep breath..... and dive on in! The most common and easy to use formula. It's easily blended, mixed, and manipulated to get the coverage you want. That said, it also comes in a plethora of options that can quickly become overwhelming at the counter. Knowing the language helps.... does it say moisturizing or allude to being emollient in any way? Then if you have oily skin or skin that's prone to breakouts, that is not the best formula for you. Oil-Control or long wearing formulas tend to be on the heavier side, and more matte, which can accentuate fine lines and wrinkles, so if you have dry, flakey skin, or are older, you'll want something a bit more on the dewy side. Tinted moisturizer is great is you have generally excellent skin, with only a few areas of light discoloration or blemishes that need to be dealt with. The coverage is minimal but will even out a bit of redness here and there. Concealer is needed to fine tune coverage. It's light, easy to apply and often has SPF, which is an added bonus. Hollywood is crazy for a luminizing foundation, just check the pages of InStyle where makeup artists sing the praises of Armani's "Luminous Silk Foundation" month after month. That's because the subtle illumination provided by that formula adds a glow to the skin that adds youth, vitality and makes them look like they're literally glowing from within. These formulas are especially excellent on the red carpet, where the lighting is out of your hands and you want the actress to look subtly radiant, not greasy or shiny. That said, it doesn't work on everyone. If you have large pores or oily skin (and the two generally go hand in hand) this type of foundation can just exacerbate the issues, settling into the pores and making your t-zone visible from space. If you want that glow, you're best adding it afterwards with a slightly luminous powder, that way you can control where the shine is. Your oils will mix in with your foundation and give you a lovely glow regardless. Your natural oil + lots of shimmer all over = greasy mess. Dewy formulations are exactly what they sound like, they leave a moist finish that leaves the skin looking fresh and, well, dewy. These are wonderful formulas for those with normal to dry skin as they are also moisturizing. (They tend to have a lot of oil in them, usually the second or third ingredient, so if you have oily skin, this is not the foundation for you.) They don't tend to offer too much in the way of coverage, but they are great for adding a little color to your face believably.....for example, if you are good and wear your sunscreen daily, as I truly hope you do, your face may be lighter than your body. This sheer formula let's you add warmth to your skin without looking heavy or makeup-y, so you can go a shade or two darker than your face and it won't look fake. Just like it sounds, this formula is on the heavier side. Great if you have discoloration (ie: sunspots--please wear your sunblock! !--or melasma) or redness (rosacea) this will handily cover these imperfections. You can always thin these out with moisturizer or by blending with a damp sponge (a wedge or my fave, the Beauty Blender, work beautifully to thin out and blend foundations). These generally come in oil free formulations too. Make sure with these heavier foundations that you really blend the edges and the jawline, and are careful to avoid getting it in the hairline otherwise it will look mask like. You really only need to apply foundation to the center of the face; bridge of nose, nose where nostrils meet cheeks (there are often broken capillaries there), chin, forehead and a touch on the cheeks. Just blend the color outward towards your hairline and jaw with a synthetic brush, Beauty Blender or wedge (fingers if you must, but I don't think you get the best results). This way you will have coverage where you need it, and less where you don't. Matte skin has gotten a bad wrap since the early 90's, in part because the formulas were pretty heavy. But formulas have really changed since then, and you can get a matte finish without the heavy, lifeless look of the past. Matte formulas are generally oil free, or have very little oil, so the finish doesn't have that light reflective quality that the luminizing and dewy quality of other formulas. But it will also remain matte throughout the day with very little powder and few touch ups. It you love the idea of a matte finish, but still want a little glow, use a blush or a luminizer with a soft sheen to it to add that extra bit of life to your skin. Again, if you have dry or older skin, a matte foundation is only going to accentuate fine lines and wrinkles, so this is not the right base for you. However, oily skin really can benefit from a matte foundation, since many are oil free they are great for those with oily skin, just be sure to be light handed with your application. Your natural oils will bring life and sheen to your skin within :30 minutes of setting your base with powder, so go easy on the base and powder so you don't look lifeless. As far as I can tell, HD formulas for foundation just means matte, which is what you need for High Definition television. Any hot spots on the face read as glaringly bright shiny areas on the screen, so having it be matte keeps that effect to a minimum. The HD formulas that I've played with still have lovely sheer coverage, so that's where the new technology really comes into play. But they are matte and can be drying so be sure to take all of the points I made about matte foundation into consideration when buying an HD foundation. Powder is a little tougher to manipulate than liquid, but it makes up for that in convenience. No worries about it being confiscated at the airport, or having it spill in your makeup bag, plus it great for doing touch ups though out the day. That said, if you have a lot of blemishes or problem areas to cover, this formula can be a little difficult to work with. 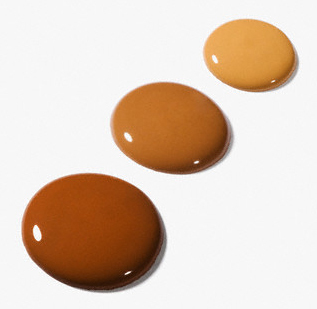 With a liquid foundation, you can use creamy with creamy, so using a concealer is easy and blends seamlessly. With a powder foundation you need to conceal first, and set those areas with powder, and then apply the powder foundation on top of that, so it can be a little tricky. I think it's a great formula for those who have great skin but just want a nice, smooth, natural finish. I don't have a lot of experience with mineral foundations, but some women swear by them. I find them to have a bit of an ashy sheen which I'm not crazy about, and I think they can accentuate larger pores, but like I said, the converts are true believes. Cream foundations are similar to a full coverage liquid foundation in the sense that you can build and blend to the degree that works for you. It's easy to layer where needed and to blend down to near skin texture. These formulas also tend to have a lot of oil in them so if you have blemish prone or oily skin, this may not be the right foundation for you (the oil in the cream can make your blemishes worse and clog your pores). Like a powder foundation, the convenience is terrific, but you should use the formula that works best for your skin, not what's easiest to carry in your purse! I hope this was helpful! If you have any questions, I am more than happy to answer them....fire away! In "Cle de Peau Beaute", "Koh Gen Do", "MAC", "Makeup Forever", "armani", "aveda", "estee lauder", "foundation", "jouer", "makeup shopping", "vincent longo"